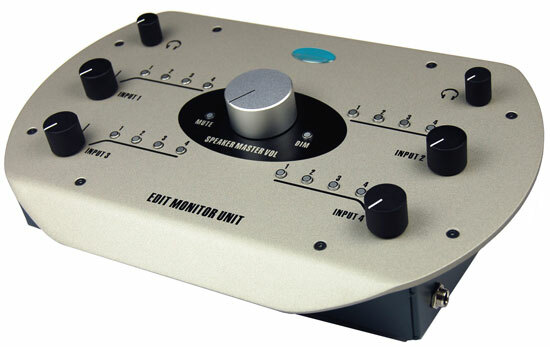 A desktop monitor controller designed especially for the edit suite. Available with either SDI or AES inputs the unit controls levels for four input channels. Each channel may be selected to any or all of the four outputs with blue illuminated halo switch indication. Two stereo headphone outputs with individual volume controls and a big volume control for the speakers. Speaker cut and dim controls with red illumination. The unit has four analogue line level speaker outputs and four fixed level for output to external metering. There are also two stereo fixed level AES outputs available for external metering. The DMD400/DMA400 includes a microphone amplifier for voice-overs with up to 70dB of gain so is suitable for use with a lip mic. The unit has selectable 48 volt phantom power available on the mic input. The DMD400/DMA400 has up to 4 frames of audio delay available for synchronising with system picture monitors switchable in single field increments. The rear view here shows the SDI version suitable for use with HD and 3G systems. An SDI out is supplied for 'loop through' of the SDI signal. AES meter outputs are available on BNC and also analogue via the EDAC connector. 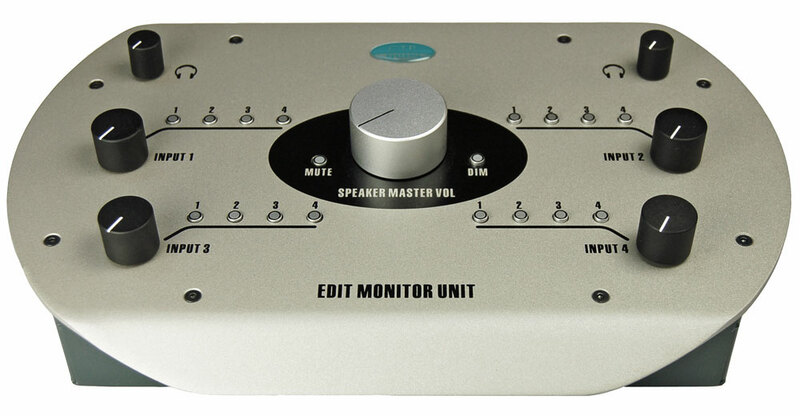 Analogue monitor outputs are also on the EDAC along with the line level microphone output. Delay is 'tweaker' adjustable as is the microphone amplifier gain. Size 30cm wide, 20cm deep, 11cm high including knobs. For the SDI version please specify the DMD400. For the AES version specify the DMA400.